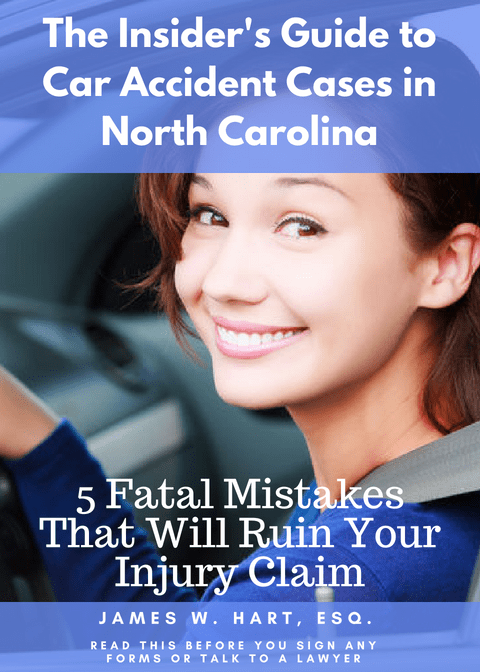 If you or someone you love have been injured in an accident, then you are probably scared, worried, and wondering how you will be able to move forward with your life in the wake of such an event. Nobody plans to get into a life-altering accident, but a quick search of the local police department websites shows that they happen every single day. The law of negligence in North Carolina is the legal doctrine you must use to recover financial compensation for your injuries. The legal theory on which you (or a lawyer on your behalf) will seek financial compensation is known as the law of negligence. Before you start negotiating with an adjuster, or decide to file a lawsuit, you must understand what negligence is, and what the four basic elements of a negligence claim are. Simply put, negligence means carelessness. If someone was negligent, it means that they acted carelessly and caused you or someone you know or love some harm. In other words, they were negligent. People can be negligent by either doing an act that caused harm, or failing to do an act that caused harm. The measuring stick to determine whether someone should or shouldn’t have acted is what a reasonably prudent person in the same situation would have done. Most often, a negligent act involves some sort of affirmative action, such as driving too fast and causing an car crash or hitting a pedestrian. In other situations, it may involve a failure to act, such as a lifeguard who fails to save someone who is drowning in a pool or a carnival fair worker that fails to properly secure someone on a ride. In addition, a business owner could be found negligent for failing to repair a hazardous condition on their premises that later injures a customer. When filing a lawsuit for negligence, you must allege and prove each of the four distinct elements of negligence. Failure to establish each of the four elements through the use of evidence will prove fatal to your claim. An element is an essential component of a legal claim. Example: When you receive a driver’s license, you took on a duty of care to all the other drivers, pedestrians, and bikers who share the road with you. Everyone who uses the roadways has a duty to obey posted signs, maintain a safe speed, and use appropriate caution while on the road. Example: A business owner has a duty to keep the business premises safe for its customers. This means promptly cleaning up spills, inspecting for unsafe conditions, and warning customers of potential hazards or fix those hazards within a reasonable period of time. Example: Product manufacturers have a duty to ensure that their products are not unreasonably dangerous to consumers of their products. Unsafe products could include pharmaceutical drugs, children’s toys, tools, appliances, or even the mosquito repellent you use while camping. Example: Medical professionals have a duty to care for their patients in a manner that is medically appropriate. If you are seeking treatment or will be undergoing a procedure, the doctor has a duty to warn you of any potential side effects or risks of the procedure. Breach of the duty of care is the second element of negligence. A person or business entity will breach a duty of care when they act or fail to act in a manner that is prescribed by the appropriate standard of care. Example: A truck speeds down a residential neighborhood street, hitting and injuring some kids playing in the street. Example: A vehicle speeds through an intersection on a red light, hitting a car that had a green light. Example: A shop owner is warned that there is a spill in an aisle. They fail to place a sign out or clean up the spill, and an old lady slips and falls on the spill, injuring herself. Example: A manufacturer imports a children’s toy with lead paint on it, selling it to consumers in the United States. The third element of negligence is causation. When someone breaches a duty of care, it must be the legal cause of the injuries suffered. However, the breach of the standard of care must somehow be related to the harm suffered by the injured party. This is tricky, and frequently misunderstood legal concept. Here are some examples. Example: A truck driver fails to use reasonable care when changing lanes on the highway. In the process of doing so, the truck strikes a passenger car that was legally passing the truck in the outside lane, causing injuries to the driver of the vehicle. Had the truck driver exercised due care in changing lanes, he would not have struck the car and injured the driver. Therefore, the truck driver caused the injuries to the driver of the vehicle. Example: A doctor is operating on a patient and was supposed to remove a damaged kidney. Instead, the doctor removed the healthy kidney, leaving the patient with no healthy kidneys. In doing so, the doctor caused the harm to the patient. Example: A passenger exits a roller coaster ride at a theme park and promptly throws up in the gift store. There is only one employee in the gift store at the time, and fail to place a sign by the vomit or clean it up. An ensuing rider enters the gift store and slips and falls in the vomit, breaking their leg. The failure of the gift store employee to clean up the mess was reasonably related to the injuries sustained by the person who fell. The fourth and final element of negligence is damages. It isn’t enough for someone to suffer a minor injury that requires a quick band aid. The injured party must have suffered an injury that requires monetary compensation in the form of money damages. Here are some common scenarios where an injured party can show they have sustained damages. Example: A truck driver fails to properly estimate the amount of room necessary to turn left at an intersection, and strikes a car with the tractor trailer. The driver of the vehicle is hospitalized, requires surgery, misses substantial time from work, and spends months in a cast. Money can compensate the driver for their medical expenses, lost wages and earnings, the pain and suffering they endured, and permanent loss of the quality of their life. Example: A passenger on a carnival ride is injured when the car that the passenger is riding in detaches from the rest of the ride, sending the passenger hurtling to the ground at great speed. The passenger suffers a concussion and several broken bones. As a result, they miss several months of work, experience chronic migraines, spend significant time in a hospital, and are forced to undergo painful and expensive medical procedures. Financial compensation can compensate the passenger for their injuries and medical bills, lost wages, ongoing medical issues, and the hospital bills associated with the accident. It is important to understand that even if you are able to prove each of the four elements of negligence, there are still situations in which the claims adjuster may deny your claim, or in which your damages may be limited in court. The insurance companies have done a good job of lobbying the state legislatures in North Carolina and other states to pass what are called “tort reform” bills that serve to limit the amount of damages that an insurance company must pay. In North Carolina for example, non-economic damages (i.e. pain and suffering) are capped at $500,000 in cases of medical malpractice. The four elements of negligence are closely intertwined with one another and often overlap. But by understanding how each of these elements are defined within the facts of your specific case will help you to properly present your case to a claims adjuster and/or the jury if you are forced to file a lawsuit. If you feel uncomfortable discussing these issues with the insurance adjuster, or if your settlement discussions break down, it is never too late to talk to an attorney about your legal rights. If you feel like you will need to file a lawsuit to recover an appropriate amount of compensation, then talking to a personal injury lawyer is always a smart idea.